“Be the change you wish to see in the world,” said Gandhi. He communicates with great simplicity the potential we all have to make change. If we want to see more kindness, then our acts of kindness will inspire others to do the same. If we want to see that no one goes hungry, then we can find a way to provide food to those in need. With any change we’d like to see, no matter how small or big, we can take the first step – create a website, start a group, or write to our Congressman. It may seem small at first but taking a stand for something and enrolling others in the cause, can lead to a movement and make real change in the world. “A man is but the product of his thoughts. 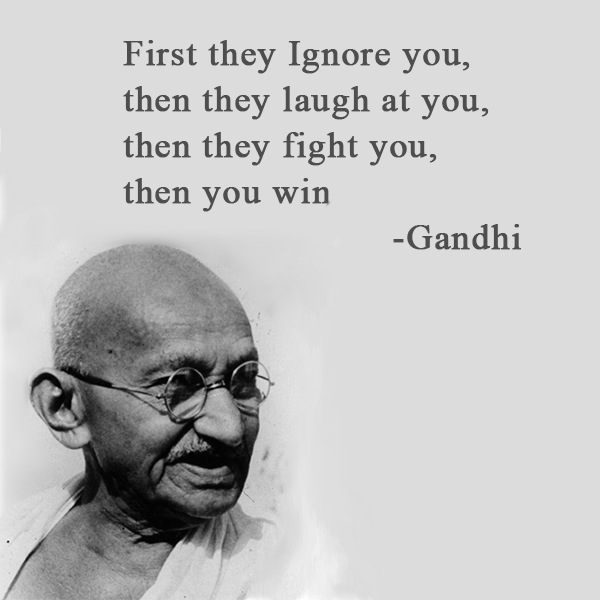 What he thinks, he becomes,” Gandhi said. Learning to recognize and stop thoughts that don’t serve us can be life-changing. Our often habitual, self-sabotaging thoughts that come from certain beliefs that we have about ourselves create fear and resistance. Mastering our thoughts helps guide us to where we want to go. If I thought that I was not good enough for a career that I am passionate about, then that career might be a struggle or never come to be. Learning to control the nature of our negative thoughts and then turning them around to more positive ones will help attract what we want. When life becomes chaotic, stressful and hard in general, focusing less on the fear of the situation and more on the love around us helps ease the pain. Love is there for us in many forms, a romantic relationship, a parent and child, a friendship, a kind gesture from a stranger, or an unexpected smile. Love makes us feel alive and is the most enduring and constant in all that changes in life. We are all united through love’s power, and its energy compels us to reach out to one another, transcending hatred, fear and suffering with peace, joy and harmony. When Dr. Suess said, “The more that you read, the more things you will know. The more that you learn, the more places you’ll go,” he understood, as Gandhi did, that to learn is to grow. Each day brings an opportunity to expand ourselves by reading, taking classes, asking questions, and listening to others. We can view learning as a great adventure and soak up all the knowledge and wisdom that surrounds us. The gift to learn is always there and to be taught and to teach enriches life. We have all experienced sickness and some of us even a chronic disease or devastating illness. All we can think about is getting better. To wake up in the morning and feel good, with no pain, rested and ready for the day, is a great day. Once we do not feel ourselves or can’t get around, is when we long to be healthy again, and no matter how wealthy we are, we would give away all our riches, to be well again. Feeling good and energetic means that we can go to work, pursue our goals, be happy and have relationships. No amount of money can replace our true wealth, our health. A sense of humor is a great thing to have and needed in so many situations where we may be “sweating the small stuff”. When we are around people who make us laugh, it’s so refreshing. Life can become all about the chores and responsibilities and not about having fun and being happy. Laughter is a relief for so many situations and makes us feel alive. When was the last time you had a really good laugh? Perhaps a good sitcom, comedy club, funny movie with friends is in order for a change in perspective. What beautiful words, “your life is your message!” How we choose to live life is a model for the young and old. But we don’t always see it this way, do we? But maybe it’s good to ask yourself how people see you? Do they respect you? Admire you? Want to be around you? Seek your advice? How people respond to you can be so telling in how you are being in the world. It is interesting to stop and think about how we are being in the world instead of always thinking about what we are doing in the world. This knowledge can be quite revealing. Gandhi’s words above go right along with Johann von Goethe’s words, “Things which matter most must never be at the mercy of things which matter least.” What we do with our days tells us what we are committed to, good or bad. For example, if someone has a dream of writing a book and it’s something that is of great importance to them, then writing everyday would be the appropriate action. But so many times, we get caught up in other things, sidetracked on the way to fulfilling our deepest desires. So the book becomes at the mercy of taking care of everything else in life and 20 years may go by and something so important was lost. Thinking about what we are making a priority in life is a great excercise. At any time, we can reinvent ourselves. If one day we choose to give-up the career we have had for over 25 years for something entirely new, we have that power. We may have to work to get there, either prepare ourselves financially or pursue additional schooling, but we can turn our lives in another direction, a better direction for ourselves. This is what makes us great! Anything is possible in our life, and we are limitless to what we can do. 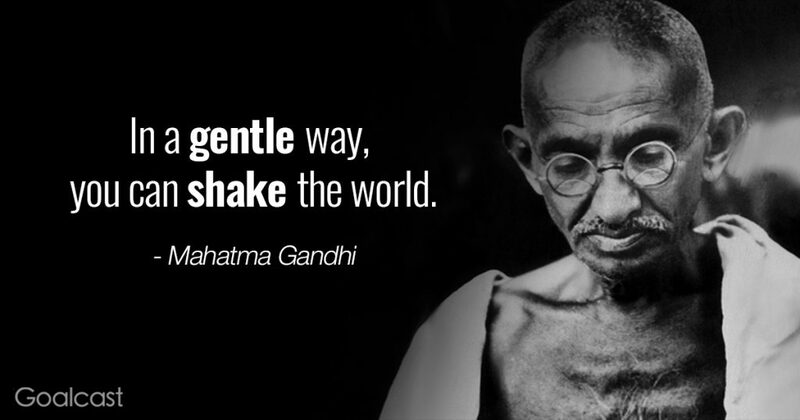 Gandhi’s life was surely a life of service. He chose to take a stand against discrimination and poverty for his people, and he succeeded. As Dr. Martin Luther King, Jr. said, “…Anyone can be great because anyone can serve.” We have the ability to help others and what a gratifying feeling it is to know what a difference we are making in someone’s life. The virtue of service takes us out of ourselves which can be the perfect healing for what ails us. Being of service can help others and change lives, even our own. Thank you Virtures of Life for putting together this beautiful list of one great Wisdom Keeper, Mohandas “Mahatma” Gandhi.